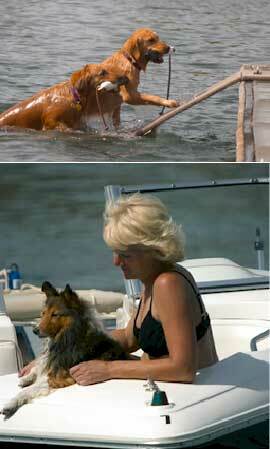 PupGear® began business in 1998 selling doggydocks™ a self–adjusting floating dog boat ramp. This was the first product to address the need for getting dogs out of the water from a boat dock, boat or swimming pool. In 2004, we invented Pup-Head™ the first portable indoor dog potty. At the time, our target market was boaters that took their dogs on boating adventures. Soon we were selling them to people living in apartments and high-rise buildings. Because we designed a product that dogs would use automatically, word spread like wildfire and the product was sold through SkyMall, alongside leading catalog companies and specialty pet retailers. Realizing that the need for our product was bigger than we imagined, we began developing Pup-Grass™ Synthetic Grass Built for Dogs. Pup-Grass® is a revolutionary artificial turf that has antimicrobials and drains 50x faster than conventional fake grass. Soon after, we introduced Pup-Zymes™ Stain and Odor Eliminator, Pup-Fresh™ Odor Control Granules and Pup-Pads™ Disposable Absorbent Pads. Other great products by PupGear® include Paw Pads™ Non-Slip Traction Pads and The Ball-Stopper® Toy Blocker and Furniture Protector. PupGear Pet Products™ is proud of our innovative products and we are thankful we have the opportunity to be part of an industry that allows us to live, work and play with passion, dedication, enthusiasm, and pride. We will continue to develop and offer products that are solution based, easy to use, practical, and of course, fun!